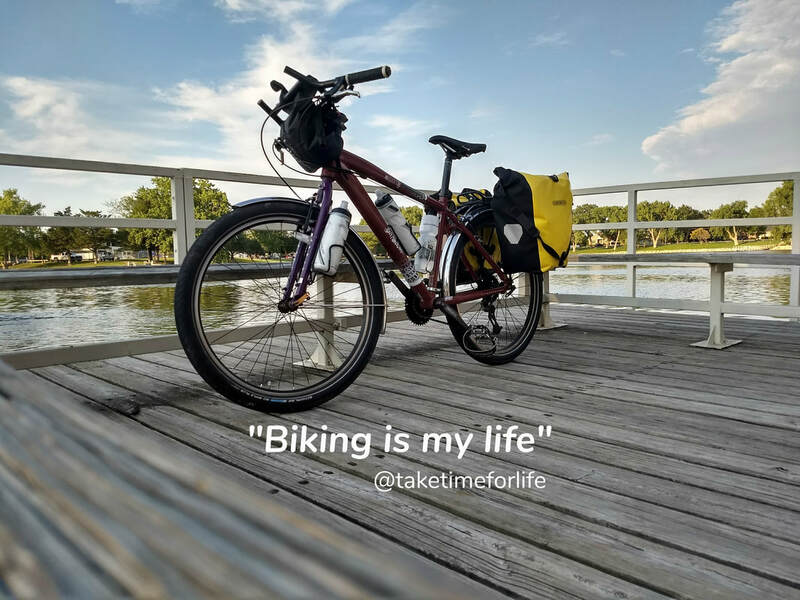 Take Time For Life - Follow me on my bike ride across the USA. 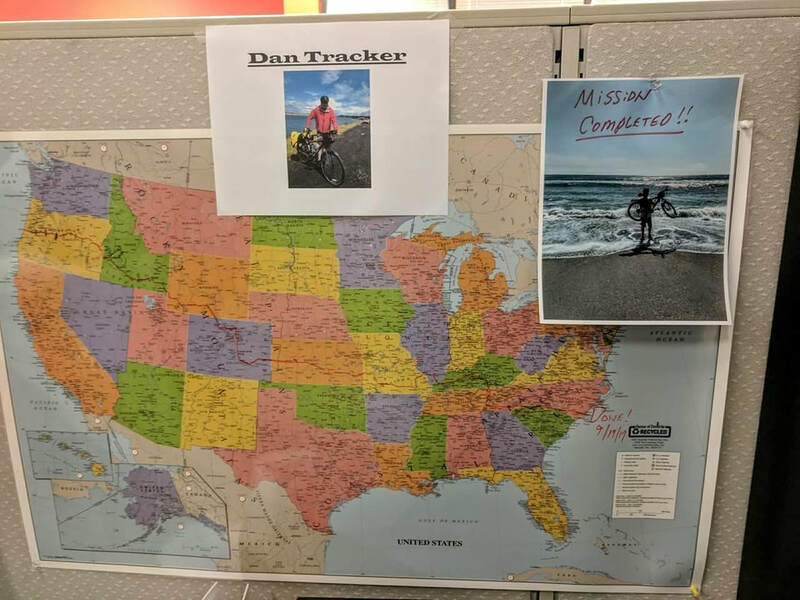 I've been "bikeless" since completing my cross country ride after donating the bike I completed my ride on to an Air Force Veteran in North Carolina. 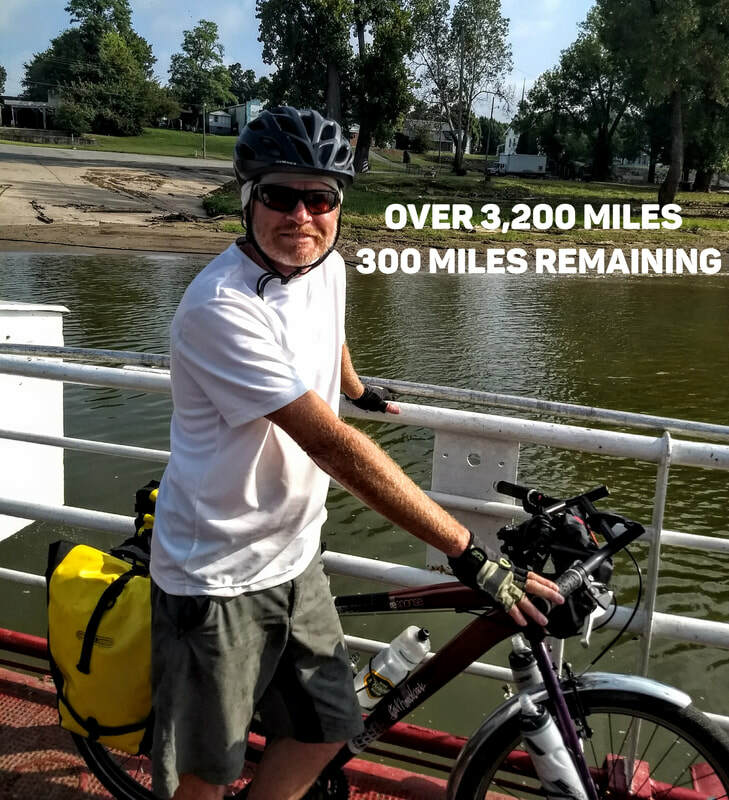 Not riding has been really difficult after completing a 3,600 + mile ride over 3 months. I've felt like a fish out of water! My very fist mountain bike purchased new in 1986, a Raleigh Elkhorn was in the back of my shed and in rough shape. I contacted a local mobile bike repair business and they worked their magic to bring my bike back to life! I jokingly refer to it as my "urban destroyer" and it's so great to be back on a bike again! Over the Labor Day holiday it took "U.D" out for my first ride since September of 2017. WOW!!!! Words can't describe the joy I felt! The fire is once again lit and my mind is racing with ideas for my next adventure! It's incredible how cycling can be such an important and enjoyable part of life! After posting on Facebook about possibly doing another bicycle tour, a friend I met on my first ride asked me a very interesting question! She asked "Is biking now your life?" Sometimes it's questions such as this...totally unexpected and spontaneous that spur great thought and personal introspection. After thinking about my friend's question, I came to the conclusion that YES it is! But not for the reasons you might think. Cycling and in particular my bike ride across the country has taught me so much about the human spirit. The kindness of strangers, the love and support of friends, to extend a helping hand to a stranger...even if it's only to shake theirs and learn more about them, to understand and accept that plans don't always go the way we hope and be open to changing them, to press on when you don't feel you can, to enjoy every sunrise, every sunset, every storm and every challenge because this is when we grow the most. To keep the faith in all situations, to not take life so seriously, not to compare myself to others and to know that everything is possible if you believe it is. So my friend...for these reasons, YES, biking is now my life! While on my ride last summer I was so fortunate to meet such incredible people all along the way. Staying in touch with as many as possible is important to me and it’s been awesome emailing, texting and talking to many of them. One of the people I met was a gentleman named Mike. He and his wife Cathy were so helpful and kind as I encountered severe weather in Toronto, Kansas. They provided me with dinner, let me stay in their RV to escape the weather and took me to breakfast the next morning. “I would like to know what your feelings are with that long of a ride. Did it burn you out? Are you chomping at the bit to do another. What kind of mental tuning did the ride do for you? WOW! What great questions! Thank you Mike! What your feelings are with that long of a ride? The only way I was going to complete the 3,600 plus mile ride was a mile at a time. My mantra quickly became “As long as my wheels are moving forward it doesn’t matter how fast I’m going”. 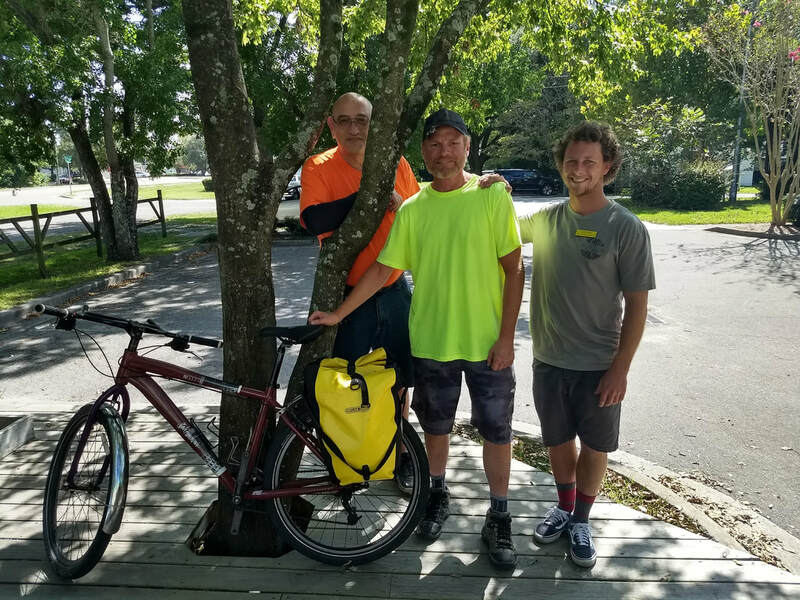 Thinking about my brother, my son and my friend Doug helped me to find that spark when I got feeling tired or questioning if I could in fact ride my bicycle across the United States! Did it burn you out? This is an easy one...NO! The ever changing landscape and incredible people kept my spirit fresh and desire to keep going strong. What kind of mental tuning did the ride do for you? This question really touched me because the impact this journey had on me was so profound. With the long days and nights alone I searched my soul many times, spoke to God and more importantly...listened! There were so many instances of love, caring, compassion and support along the way that my heart and soul couldn’t help but become stronger. I so vividly remember the State Park in Kentucky (Rough River). It was labor day weekend and the narrow mountain road was busy and dangerous with many holiday travelers. A gentleman (Frank) offered to give me a ride to the park, paid for my site, gave me money for dinner and returned the next morning to buy me breakfast and see me off! Are you chomping at the bit to do another? YES! YES! YES!!!!! I can’t get started soon enough! I donated my bike to a veteran when I got to Atlantic Coast and haven’t replaced it yet but it’s at the top of my list! I don’t know what my next adventure will be but if it’s anything like my journey last summer I’m in for a great time!!! 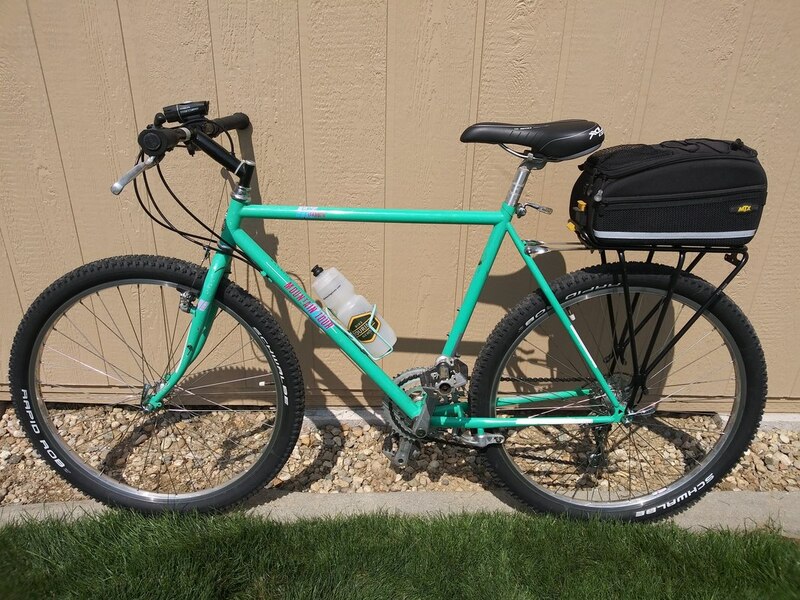 As indicated in my last blog post, I wanted to donate my bike to someone that would appreciate the story behind it and would be able to put it to good use. 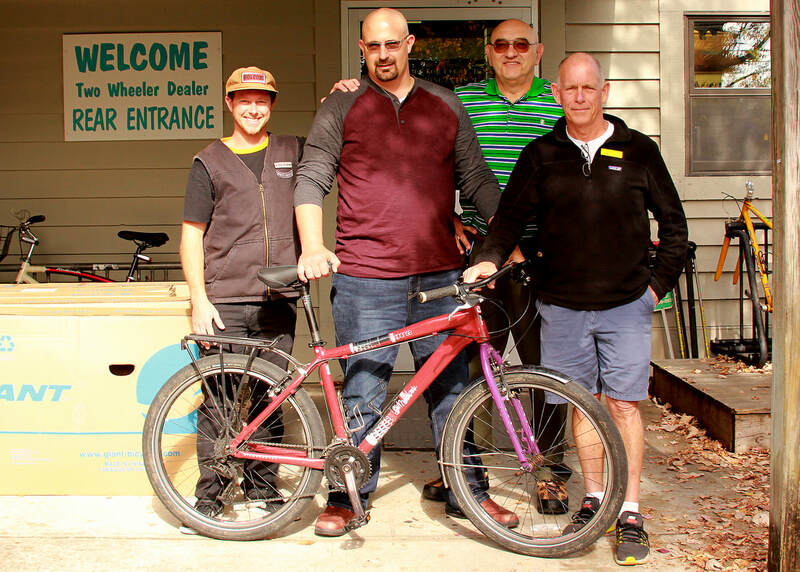 When I stopped off at "Two Wheeler Dealer" in Wilmington, NC at the conclusion of my ride I was planning to have my bike shipped back home but after the many blessings I received on my journey I decided to donate it so someone else could enjoy it! Today I received an email that made me so happy! I met with Jonathan at the bike shop and he put me in touch with a gentleman in the community, Frank who assured me that he would do all he could to get my bike to a veteran that would appreciate the bike and the story behind it. Well, Frank came through big time and was able to get "Bobnick" to a US Air Force Veteran, Brian Sims! Brian will be using the bike to get back and forth from class as he begins his studies at UNC-Wilmington. Thanks to Johnathan and Jim from "Two Wheeler Dealer" for making sure Bobnick was all set up and ready for Brian to enjoy. Brian, thank you so much for your service! On behalf of my brother, my son Nick who has enlisted in the US Air Force and everyone that supported me on my bike ride across America, I hope you enjoy your new bike and may God Bless you! Hard to believe that my journey has ended! So many people, events and memories that will be with me forever. I'll be posting more about my journey in the coming days but wanted to share what I've to decided to do with my bike. As I rode from the beach to the bike shop where I was planning to ship my bike back, I was reflecting on the past 3 months and all the incredible people I met along the way. When I got to the shop I was greeted by Jonathan and after telling him about my ride, I asked him if he knew of any local organizations or if his shop had any programs to get bicycles to people that may not be able to get them any other way. He told me about a number of organizations they've worked with including a gentleman named Frank from a local church. We started talking about the program and he called Frank asking him if he was available to come to the store which he did about 20 minutes later. We talked about my ride, why I did it and I told him that I was interested in donating my bike so that someone else could experience the joy of cycling that may not otherwise be able to. After several minutes of chatting together he mentioned that he works with veterans and wounded warrior groups in the community. That was all I needed to hear! I told him if he could get the bike to one of these heroes I wanted to donate it. He said that he would hold onto the bike for as long as necessary until he finds the veteran that will appreciate the bike and the story behind it. When he finds the perfect person, he will contact me with their name, telephone number and will email a photo of them with their new bike. To all the men and women of our military, thank you for all you do. It's because of you that I was able to complete this bike ride and I am honored to do this on behalf of my brother Bob and my son Nick. I hope the person that receives the bike enjoys it as much as I have and draws inspiration from the history of it . Thanks to Jonathan at Two Wheeler Dealer for your help. If you've been following my journey for any amount of time, you've likely heard me talking about my friend Doug. We've been friends for over 17 years after we met at a previous employer. I detoured off the TransAm route and went down through Tennessee and North Carolina so I could see him and his family. The moment you walk into their home you can literally feel the love of this family! Today I was finally able to get back on the road after a couple days waiting for the remnants of hurricane Irma to pass. The ride today was AWESOME!!! I'm now only 69 miles from Charlotte where I'll be able to see my dear friend Doug and his family! I can't wait!!! In just 12 days I will be back in Boise, returning to work and seeing my son Nick...Each of the final miles are bitter sweet. I'm looking forward to completing this incredible journey of a lifetime but will also miss the people, scenery and life experiences that this trip has blessed me with. Final 350 Miles Proving to be the most difficult! I've been at a Warmshowers hosts home for the past 2 nights and they've been wonderful! Mark and Barbara have been so helpful as I wait out the remnants of hurricane Irma. I was hoping to get back on the road again this morning but because of high winds, rain and road closures due to debris I am not able to which means I'll be here for 3 nights! 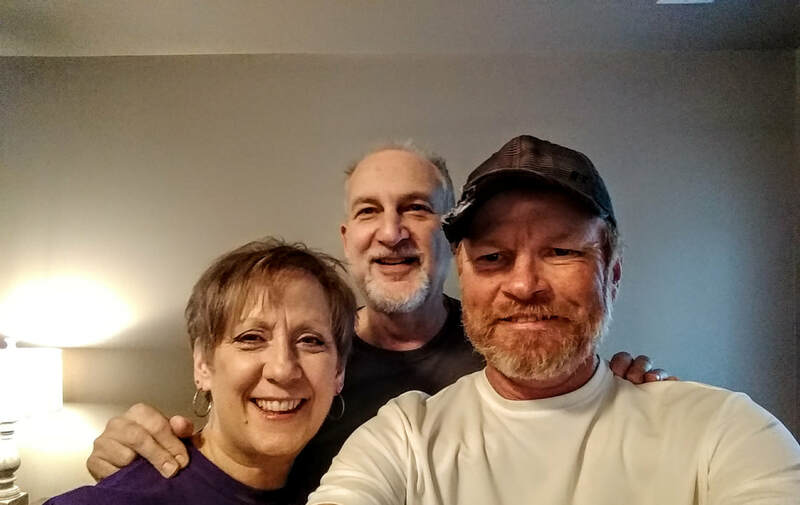 I'm so thankful for the hospitality that Mark and Barbara have shown me! I contacted my friends in Charlotte letting them know that I will be arriving several days later than I had originally planned. All the delays due to weather have me stressed as I need to be back work on the 25th. I have roughly 350 miles to complete in 8 days or so which is easily doable if the weather cooperates but it doesn't seem to be. So, I am looking at alternative options for return transportation to Boise including airlines. The bus takes about 4 days to get to Boise so flying would give me up to 4 days longer to deal with the weather, complete my trip and still return to work on the 25th. The issue with flying back is the costs this close to date I would be flying out. 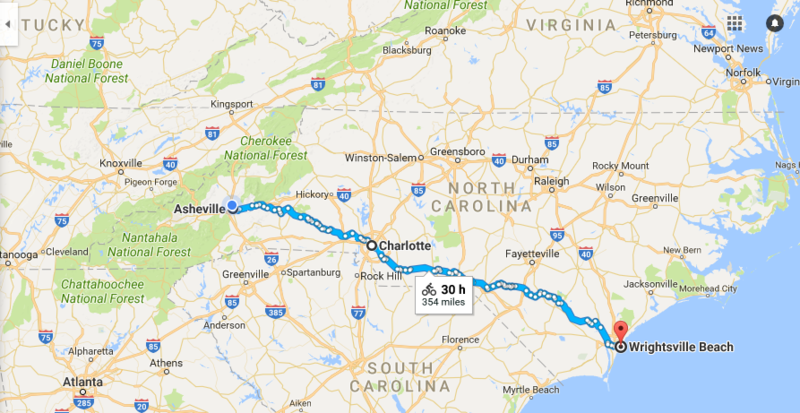 I also need to ship my bike back from North Carolina. Weather was an issue at the beginning of the trip causing me to stay in hotels that I hadn't planned or budgeted for and now it's also playing a role at the end of the ride but in even greater terms because of the hurricane and more in the forecast. 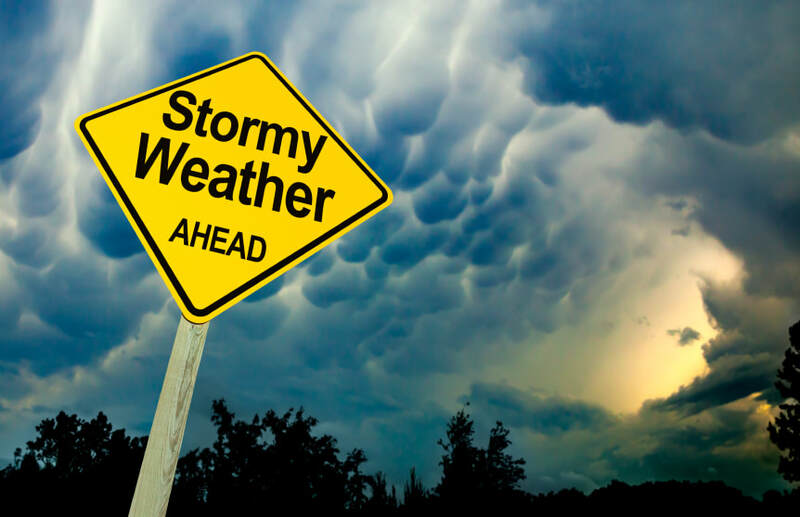 Mark was just telling me that local officials are urging residents to stay off the roads due to fallen trees and other debris across the roadways due to the wind. Flying back to Boise is looking more and more like the best option but is also the most expensive and I'll need to make reservations in the next day or two or the rates will be even higher. I'm so appreciative for all the support I've received for all these unexpected expenses! Below is a map of the remaining 354 miles of my cross country bicycle ride!